I have to admit that the holiday break from school gave me a much-needed break from preparing tree nut/peanut-free, real food, budget-friendly school lunches for my kindergartner every night. I truly don’t know why I feel that packing a lunch is such a pain when I would at some point be making lunch for my daughter regardless if she were at school or not! I guess it’s just the transportability and nut-free aspects that really put me over the edge so metimes. So, as promised, here is a follow up to the school lunch post I did awhile back with some new ideas and pictures. Coming up with these ideas feels like a struggle on most nights, but I of course eventually (have to) think of something to pack for her! 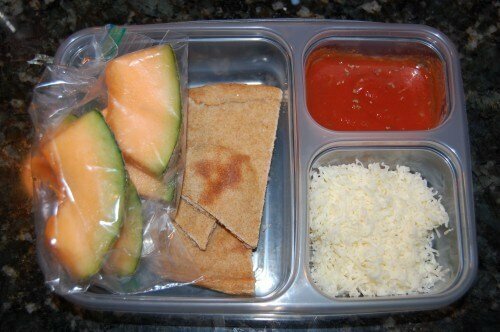 Homemade pizza lunchables with fruit! I got this idea from a blog reader and love it. I basically bake whole-wheat pizza crust plain, cut it into triangles and freeze them in a big bag. I also freeze seasoned tomato sauce (or pizza sauce) in ice cube trays. Once the cubes are frozen I move them out of the trays into another big freezer bag. At least once a week I pull out 2 or 3 crust triangles, 2 sauce cubes, grate some cheese and add some fruit. My daughter loves this lunch and it is one of the easier ones to put together the night before (once all the advance preparation is done of course!). Chicken nuggets with ketchup, grapes, whole-wheat macaroni noodles, and peas (all served cold) – Okay, so I admit the ketchup aspect of this would not officialy be “10 Days of Real Food” approved due to the sugar in it. You could of course attempt to make your own ketchup (which I never thought was as good as the store-bought stuff) or make a different sugar-free dipping sauce like honey mustard. Regardless, this has been one of the very few “exceptions” where we’ve broken our original rules since we do believe anything in moderation is okay! 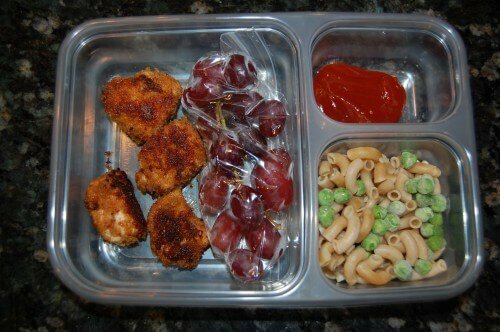 If you are interested in putting chicken nuggets in your child’s lunch too just make a few extra the next time you have this for dinner or pull some out of the freezer if you were already good enough to make some in advance. Fruit smoothie, grapes, egg salad and (brown rice) crackers – This little yellow apparatus that is pictured is the best way I’ve found to transport smoothies to school. I’ve mentioned these reusable freezie pop type things before in a “summer treat makeover” post, and I was originally only giving these to my girls as a dessert. But all of that changed when I was desperate for a way to easily send smoothies to school. So now anytime I make smoothies I fill up these things with the leftovers and just stick them in the freezer. If you like to use the divided Tupperware trays (and like to fit everything in it like I do!) it is easiest to fold up the end of the freezie pop holder and put a rubber band on it before it freezes. Plus even if it is not in a Tupperware container (I do at least recommend putting it in a zip lock bag) it is best to use the rubber band to avoid a big mess if/when the top comes off in their lunch bag…not that I know from personal experience or anything! By the time lunch rolls around at school the smoothie is only partially frozen and my daughter loves it (plus I think her classmates are a little jealous since it does look so fun and interesting). These always come home completely empty! 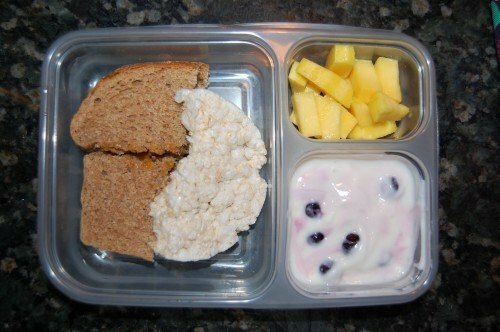 Sunflower butter & peach jelly (real fruit spread) sandwich, brown rice cake, mango, and yogurt with berries – The trick with this lunch is to NOT use the flavored yogurt from the store (flavor it yourself)! Both of my daughters absolutely love yogurt and when we first switched to real food I thought we’d have to give it up all together since plain yogurt is so disgusting by itself. Then one day I realized they would scarf it down just the same if I simply drizzled in some honey and frozen organic berries (which change the color of the yogurt by the way). This is now one of my daughter’s favorite things that I send in her lunch. Not to mention frozen berries are so much cheaper than fresh! One other thing about the rice cakes though…both of my daughters love these crunchy things, but you must read the ingredients to make sure they are made with brown rice (and are therefore whole grain). In addition to these lunches let’s also discuss snacks for a moment. I don’t know about you, but I have to send both a lunch and a morning snack for my daughter everyday. For her snack I’ve tried different combinations of “trail mixes” using pumpkin seeds, sunflower seeds, crackers (Triscuits or brown rice crackers), raisins or other dried fruit, and whole-wheat pretzels. I’ve also s ent in whole fruit like bananas and apples. But, by far, her most favorite snack (that she prefers to have every single day, which certainly makes things easy for me!) 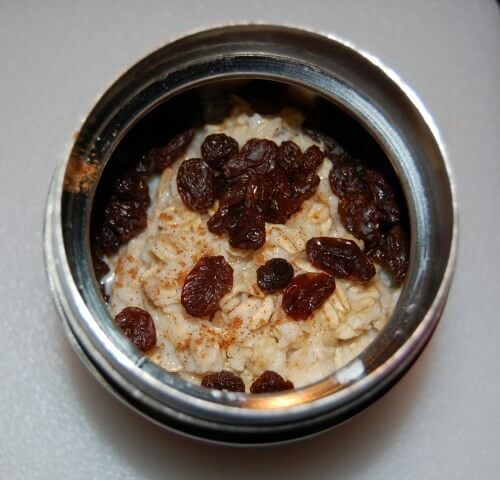 is warm oatmeal in a Thermos. So every morning I heat ½ cup plain whole-grain rolled oats and about ¾ cup milk for less than 2 minutes in the microwave. Then I drizzle in some honey and add cinnamon and raisins. I pour it right into her Thermos, which keeps things pretty warm until snack time. I am not a big fan of oatmeal myself, but it sure is a filling snack, she loves it, it’s easy to make, and it is 100% whole grain. You can’t be that! If you have any suggestions or other ideas please leave them in the comments…I love to hear from the blog readers! These are great ideas! My 14 month old goes to daycare and I can’t stomach the slop they serve for lunch so I pack his lunch everyday and it stresses me out too. Is hummus a real food? I pack hummus and crackers for my son a lot. I also do cream cheese in place of the peanut butter too. I need to get to whole foods for some sunflower butter. I actually freeze pureed fruits and add a couple of cubes to his yogurt at night when I pack his lunch. What kind of crackers are you sending…whole grain? I also occasionally do cream cheese in place of peanut butter (when I can afford it) and luckily my daughter loves it! I also love the idea of freezing pureed fruits to add to stuff like yogurt (even though my girls are very far away from the baby food stage!). I was wondering about the lunch box itself. When you put sauces, etc in it, don’t they get all over the lid or into other compartments? It seems like it would be messy and I would not be sure if my daughter could get the lid on tight again to bring it home. Just a thought on the pizza- maybe you could use cut up Pita triangles instead of having to make a crust? I can usually find pita bread with very few ingredients. Thanks so much. I love reading your blog!! Sauces do get on the lid, but they do not at all spill into the other compartments. My daughter somehow manages to get the lid back on, but I have given her instructions before like licking her spoon and wiping it off (after eating yogurt), and putting the lid back on so I am sure that has something to do with it. It is a ziplock brand divided container (from Target), which only cost several bucks for a set of two…so a very small investment if you want to give it a shot! And pita is a great idea if I am all out of the pizza dough (or even biscuits too)…thanks for the tip! I’ll be checking back to this posting to get some fresh ideas – we feel a little burnt out of the same-old same-old here. I think your lunches look great…and now I really want those silicone molds! i love your lunch ideas! we have nearly the same lunch containers and am always looking for new ideas for lunch that they would like over the hot (nearly 100% processed crap) school lunch. I do hope you keep the school lunch ideas coming, even when you are done with your 100 days of budget real foods!! Thanks so much for your lunch ideas. My daughter has her first day of brining her lunch to preschool tomorrow and I am already dreading having to do this every day for kindergarten next year! No peanut butter is a real limitation for us because we really don’t eat sandwich meat. I appreciate your ideas, please keep any new ones coming. I need to print them out and keep them in my kitchen for next year. My first grader likes cream cheese sandwiches with a fruit spread. Just throwing this out for a little change in the mix. Lunches are challenge. My daughter actually loves that too…thanks for the reminder! Thank you for the lunch ideas. My son’s school does not have a lunch program, they have a couple of local fast food places that students can order from if they choose too, or bring a lunch from home. My son brings his lunch from home and attempting to keep the lunches interesting, good for him and be able to “keep” in a lunch box continues to be a challenge everyday. Thank you again for the ideas. I remember reading one of your lunch posts before and thinking to myself that I needed to get some of those ziploc tupperware containers. I never bought them! So now I’m putting in my list for next time I hit up the grocery store. I love the idea for plain yogurt sweetened with honey and some organic berries. I will have to try that for my kids! These are awesome ideas! I’ve been struggling with ideas for my two kids. For tomorrow’s lunch, I did fresh fruit (watermelon, red and green grapes) on cute little picks (they are plastic and had fish on top) that I got from Oriental Trading Company. I also did tortilla roll-ups. I did chicken salad for my daughter and peanut butter and fruit spread for my son. Then, I added cheddar rice crackers and a Stonyfield yogurt thing (like Go-gurt, but organic). I do like your homemade smoothie and fruit yogurt ideas! Right now Oriental Trading Company is having awesome sales, so I got themed picks (fall leaves, skeletons, four leaf clovers, flowers, fish) and super cute napkins (Barbie, skate board, etc.) I thought these would make their lunches festive and interesting. Love your blog! I love the idea of cute little plastic picks…my daughters would both get very excited about something like that! So happy to see this topic come up here! I pack for myself, my husband and my 3 elementary schoolers every. single. weekday. ugh. We do get burned out, but it’s worth it since my daughter hasn’t a migraine since we tossed all the processed stuff. She actually refuses to eat school lunch now for that reason. Can’t say I blame her! Some “main course” ideas for the kids: breakfast-for-lunch (boiled egg, cereal, milk, OJ, banana), tortilla chips & salsa, thin sliced ham/cheese rolled w/pick, pretzels/hummus, salad w/ toppings & dressing, tuna packets, quesadillas, homemade muffins (carrot, blueberry)… We rarely even do sandwiches anymore. Depending on the “main course,” I also add a fruit (recently added pomegranate & mango to the rotation), a veggie (just found cute Spongebob edamame single serve packets), a protein (sometimes almonds or walnuts instead of the standard meat/cheese/yogurt, also love the Stonyfield “go-gurts”, will have to try Babybels) and a water bottle. I LOVE the homemade pizza lunchables idea; we’ve used it a few times over the past couple weeks, since I read it on here, and it’s a huge hit with my kids. I love being able to pack a healthy version of Lunchables. Thanks for the great idea! I always liked when my mom packed cheese and crackers for my lunch. As an adult, it is still one of my “go-tos”. I always splurge on local cheese and pack it wheat crackers- always delish! That could almost be another version of a “homemade lunchable”!! These are great ideas! I always hated school lunch food. I’m in high school and I usually have Cross Country or Swimming practice after school and I was wondering if you had any larger portion ideas. (I’m vegetarian.) My family isn’t really on board with the real foods idea, but I’m considering the ten day challenge with some of my food-conscious friends. Last year many of us read “The Omnivore’s Dillema,” “Fast Food Nation,” “Food Inc.,” and some book about GMOs and we’re very interested in real foods. Thanks for the great ideas! You could get a Thermos (we use thermos brand), they stay hot. We do bean burritoes, use organic refried beans with cheese and green onions and some whole wheat wraps, heat in glass measuring cup til really hot and put in thermos, wrap up the wraps and then spoon mixture onto them. My kids love these. We also do pasta and veggie salads with homemade vinegarettes in thermos, a side of fruit and pb n celery or veggies and dip are great too. Real yogurt with frozen berries and granola, pretzels with peanut butter, cheese wedges, tuna salad loaded with veggies or egg salad loaded with veggies and triscuits are yummy. I don’t know how much real food you are eating yet, but when you get on a mostly real food diet we have found that the food is much more filling than the processed stuff made with white flour. So often times my portions are not that much bigger than my kids! Especially if you find good, real sandwich bread (made with 100% whole-wheat and 5 or so ingredients)…it really fills you up. Good luck, and I think it is great what you and your friends are doing (so young!). oh my goodness! I am in the very same boat! We like to avoid “highly” processed foods, which we define as anything with more than 5 ingredients (or containing white flour or refined sugar). We just had to draw the line somewhere. Is tuna fish too processed? That would be a good school lunch sandwich if it works with the rules. We use our thermos a lot to put in last night’s leftovers. My kids took leftover applesauce chicken from last night in their thermos and a side of fresh raspberries and grapes with almond milk in their drink thermos. I am a big believer in raw foods being more nutritious so these are the things I pack in my older dd’s lunchbox. We are an all organic household as well and my kids are never sick and have never been on antibiotics. -Cut up raw yellow, orange & red peppers (not only is it pretty and colorful but they taste sweeter raw), raw carrots, celery. -Cut up canteloupe, honeydew melon, apple, pear, banana, grapes, orange sections. -Cheese Quesadilla – my dd will eat it cold, same with grilled cheese sandwich. -Whole full fat organic yogurt that I add honey too. -Apple/chicken/cheese quesadilla with a little salsa. I love your ideas, but I have to figure out how to adapt them for my 14 year-old son who is going into high school, into sports, and is always hungry! (He actually grew half an inch in two weeks!) So he seems to need more food. I’m trying to make just enough food for dinner so we don’t have leftovers to save money…I am seeing that planning ahead is key. Do the Ziploc containers leak between compartments?? I really would love to do this for my 4 sons lunches, but I’ve seen how they throw their lunch boxes around and don’t want everything to leak together! They don’t leak at all…one of the great things about them! I just found your blog and am really enjoying it so far. I love these ideas! My kids always want what we call “tapas lunch” which is usually a rolled up piece of turkey or salami (Applegate), olives, veggies, fruit, nuts… whatever I have in the fridge that I can pile on a plate. But that is so hard to do for school and I end up with nine million little containers that they have to open and re-close. So I’ve been trying to find a bento-type container without spending a lot. I am definitely getting those divided containers next time I make a Target run! Also – I love the Stonyfield yogurt tubes too, but I freeze them, so by the time they have snack they’re thawed, and they also double as extra ice packs. 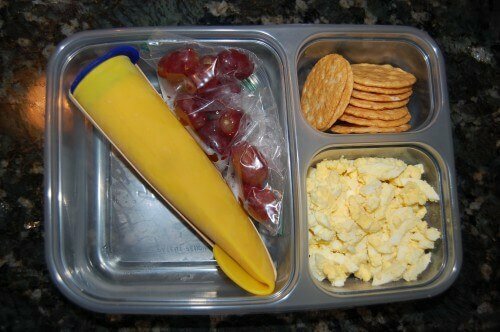 My kids favorite lunch is cubes of grilled meat, a few cheese cubes, a handful of trisciut crackers, and fresh fruit. I grill extra meat, but I also grab every scrap of leftover chicken or steak or pork from dinner. Freeze in serving size, they thaw by lunch. I’m a big fan of laptop lunch boxes. They have a box with several smaller boxes inside. Two of the four that come in the set have lids, or you can buy a supplemental set that has lids on all four containers. It’s a quite flexible system. We also have goodbyn lunch boxes, but they aren’t liquid-tight, so they’re only good with all dry meals. I prefer the laptop ones, because I can pack two separate meals, each with a cold pack and insulated sleeve in my backpack. The goodbyns are HUGE–I can pack lunch for both myself and my boy in one, but we have nothing insulated in the right shape or size to keep it warm or cold. The ziplock containers look nice, as far as being a nice size and liquid-proof, but they are disposable, and I see you use a lot of baggies with them. But with the laptop lunch boxes, you can skip the baggies, too, which reduces trash. How do you make the container you have for the smoothies? Also you said the ziplock containers don’t leak into other compartments? Thanks! p.s. I NEVER would have thought to put oatmeal in a thermos! Great idea! i am showing my daughter the pictures and she said “i wish my school made those lunches” i said “we are going to make these lunches”. She is so excited! You rock! I love to hear that!! If you aren’t subscribed make sure you keep checking back b/c I’ve been posting lots of new ideas. I also like to use plain yoghurt to avoid the excess of sugar. We have huckleberries where I live, so often we have frozen huckleberries along with honey in our yoghurts. Another way I like to make it, because it’s cheap, and a nice variety, is to mix 100% juice frozen juice concentrate in the yoghurt. It really tastes like the sweet store yoghurts that way, but minus the processed sugars. Thinking about school lunches…thanks for the pizza idea. My daughter loved the lunchable pizza. I think we can swing a whole school year with real food thanks to you! I bought lunchboxes/food container set from gogreenlunchboxes.com They are bigger and hold more food than the ziploc containers if you are making lunches for older kids/teens or adults. It even has a small water bottle in it also, so everything is in one place. LEAKPROOF!! The are great, definitely worth checking out. Food container, water bottle and lunch box to carry it all are all included. I just found you site and I’m pretty intrigued! I don’t know if we could go all out but your lunches look so much better than what is served in school!!! I’m thinking this would be a good place to start making a few changes. My son especially loved the idea od taking a smoothie to school! One question, how long will they keep in the freezer? Could I make several on Sunday and have them on hand for the week? Yes you could make the smoothie pops several weeks in advance and they would be fine. Good luck! Fortunately for me, my first grader’s school is not peanut free. One of her favorite things I pack her is what she calls “peanut butter banana tortilla delight” (she made up the recipe one day and called it that…..too cute). I spread PB onto a tortilla, then put banana slices on top and then add some mini chocolate chips and roll it up. She loves it. It would probably be just as good with sunflower butter or soybutter. She also loves the make-it-yourself pizzas. I use an English muffin as the “crust”. I never would have thought she would like that, but last year it was served as the snack at her kindergarten Halloween party and she loved it and asked me if we could make them at home. She takes it for lunch at least once per week. I also give her sliced black olives in a separate container as a topping. Just last night she and I were talking about making homemade lunchables too. I told her we could cut ham and cheese into little heart shapes and pack them with some crackers. She loved the idea, so I’m going to try it next week. My son’s daycare is a different story. His room is peanut free, so I am always looking for alternatives for his lunches. I bought him sunflower butter the other week to try and he did NOT like it. Maybe I’ll have to try again in a sandwich with jelly or something. I am a mother of 2 children with Severe peanut and Tree nut allergies and I just want to applaud you all for taking the time to come up with safe and healthy alternatives for your children! I have heard several of you mention the sunbutter and I wanted to share a different brand with you that my family likes better (less aftertaste) it is called “I am Healthy” there are various versions of it….crunchy, honey, even chocolate. We enjoy the smooth honey flavor the best. It can be found at Kroger, Ralphs. Whole Foods and Fresh Market….I believe Trader Joes may carry it as well?? Anyway…I realize it is more work for those of you with no allergies in your family….but it makes a world of difference to the child, and family of the child with life threatening food allergies that you take the time to help keep the environment safe for them! THANK YOU! Help, help, help!!! I can’t get the lids to stay on my freeze pops (the same ones you have). Any tips??? Well, I mostly bend the ends of ours and fit them into my daughter’s plastic zip lock divided lunch container, which keeps everything in place. Another option is to bend the end up and secure it with a rubber band (that stretches across the top over the lid). I hope that helps! Hemp seed -I mix it with everything to add some protein…oatmeal, apple sauce, pasta, soups. My 2 year old loves it. Thanks for all the great ideas! Love your blog. Just wondered if you’ve seen Organicville’s ketchup? I live in Canada, so I don’t know if you can get it where you are, but it’s sweetened with agave nectar (a natural sweetener) instead of refined sugar! We actually don’t use agave nectar either…but thanks for sharing! Just found your blog through Pinterest. I LOVE your stand on “real food”. Thank you for the many great ideas for nutritious meals, specially the packable kid’s lunches! I love your lunch ideas and this blog but I can’t help noticing what a burden it seems to you that you cannot pack anything with nuts. My daughter has a tree nut allergy and for her it is life or death and when another parent makes it seem like such a burden that they can’t have peanut butter in their lunch boxes well it begs the question ‘what if it where your child’. I know that I never would have thought about it before I had children but now that their are many kids with these allergies I think that having this requirement is vital. I hope you understand this as your post your blogs and when you pack your kids lunches because there are parents out there that read these blogs for your great ideas not your inconveniences. Some parents are thankful that they can send their kids to school without having to worry about an allergic reaction or their child dying. As a fellow parent of school aged children, I have to say that most of us without food allergy issues don’t actually feel inconvenienced as you describe it. I know it must be frustrating for you but please consider another side. My son is as skinny as a rail with an extremely high metabolism. Since starting kindergarten he’s not gained any weight and has slipped from his normal weight curve. He’s gone from 97th % in height and 75th % weight to 97th % height and 50th % weight (doesn’t sound that bad, but as tall as he is, 50th % weight is about like an average height kid being in the teens for weight). A big part of this is b/c he’s not given more than 20 mins to eat his lunch and the school sends them out to the playground after lunch instead of before, so he’s got way too much incentive to be done with lunch as fast as possible. The other problem is that food I send can’t require much effort or he won’t eat it. He eats a huge variety of things at home but is much pickier about it at school. So it can’t be “weird”, which seems to change from day to day and is somewhat dependent on what his friends think is weird. If I would/could send pb&j or ab&j (almond butter) everyday he’d eat every last bite. PB & AB are nearly perfect foods since they are high in calories with lots of protein and good fats. He won’t eat sunbutter (don’t blame him, I won’t eat it b/c I don’t think it tastes good and I love sunflower seeds) and he’s not crazy about cream cheese sandwiches. There are about 3 things I can send in his lunchbox that he’ll “usually” eat, nut butter and fruit spread is nearly fool proof. So it’s not just that it’s inconvenient not to be able to send nut butters, it can be health threatening for many of our kids not being able to send them with the one food we know they’ll eat. So there’s 2 sides to every coin. And I have to say, and I don’t say this to be mean spirited, if my child faced the risk of dying because of coming in contact with a food at school, I’d home school them to make sure they were safe. I get sending them if they might have an allergic reaction, but I don’t personally understand putting ones child’s life in the hands of those who could never love him as much as his/her parents. No amount of my child feeling “normal” would ever be worth that risk to me. I just found your blog and so far love the idea behind it though I’ve not gotten thru too much of it. I landed on it looking for school lunch ideas and there are some good ideas here! But I’m curious how you can be so concerned with real food but seemingly unconcerned with putting your kids food in plastic containers and bags? I know Ziplock says they don’t use BPA, but there are many other disturbing chemicals in plastics. Plus, unless you wash and reuse, the plastic bags go into the garbage after a single use. I’ve switched most all our containers to stainless. There are so many great reusable bags out there and they are even really easy to make if you can sew at all. I do have some safer plastics for non-wet foods like chips/crackers b/c the reusable bags don’t keep them from breaking. Stainless and reusable bags as well as safer plastics do carry a higher initial investment, but stainless will last forever and the others will last way longer than the thin plastic used in Ziplock containers. LOVE your ideas! I have one picky eater & one who will eat everything. Your blog has helped me so much! We bought the Norpro silicone set & the Easy Lunchboxes. I am having my girls (6 & 9) use them now so they know what to expect when school starts. They love all the creations I have made! Thank you! Hi! Great post. I post about similar things on my site b/c we do the Feingold Diet. One question: Your kids will eat cold chicken nuggets? I’ve been trying to think of a way to send in warm chicken nuggets. I drop off their lunch about once a week so I just do it that way. I wish they would invent something! Thanks for sharing! I definitely have to get some of those ziplock containers. I never would have thought they would keep the food in each separate compartment from leaking into the other. We did try those juice/water bottles from Thermos and they do leak for us. :( Still can’t find one that doesn’t leak and we’ve tried them all. Now we just use small plastic water bottles from Costco. Thanks Amy. I am trying to make some small changes first. Today I packed strawberries and carrots. The first time a fruit AND a veggie ever went to school together in one of my children’s lunch boxes! I’m just trained to think a bag of chips and a sandwich. Thanks for the great ideas!! How does granola maintain crispness when places on top of the yogurt and fruit? I’ve been marginally successful with this but find it easier to send the granola separate for my boys to sprinkle on during lunch. I topped it myself yesterday morning and the whole thing came back uneaten yesterday afternoon :( I hate wasting food then feel bad that my child didn’t get to eat a “full” lunch! hello, there is a lot of comments on amazon saying that the freeze pops have a chemical small. What is your opinion on this? What brand/where do you buy the brown rice crackers pictures above? We eat the ak-mak kind and some variety in crackers would be great! I absolutely love your blog and my family and I are going on a year now of no processed food, thanks to you!!! We are feeling pretty great and a lot of health problems my son was having has vanished! Hi Brie. I am not sure of the brand pictured but Lisa often buys Crunch Master brand rice crackers.